When houses are being built, decisions are often made that at the time seem perfectly logical. Such was the case in a recent project in a gem of a house in Knoxville, TN. When the house was being built in the 1930s, a decision was made to install decorative face nails to a wide plank oak floor. It provided a rustic look to a surface that all to often, especially at that time, looked too mundane. If you have ever been around coastal houses, it is not unusual to see this type of nail in the exterior siding. It is quite attractive and impressive. I’ve seen face nailing on many, many older floors. It was a popular way of making sure wood stayed in place. Even though the hidden nail in tongue and groove installation has been around for centuries, face nailing a floor gave you an added amount of structural integrity, especially with wide boards. Typically, these nails were installed to be flush with the surface. In the case of the house in Tennessee, the heads of the nails were larger, round and left raised above the surface of the floor. 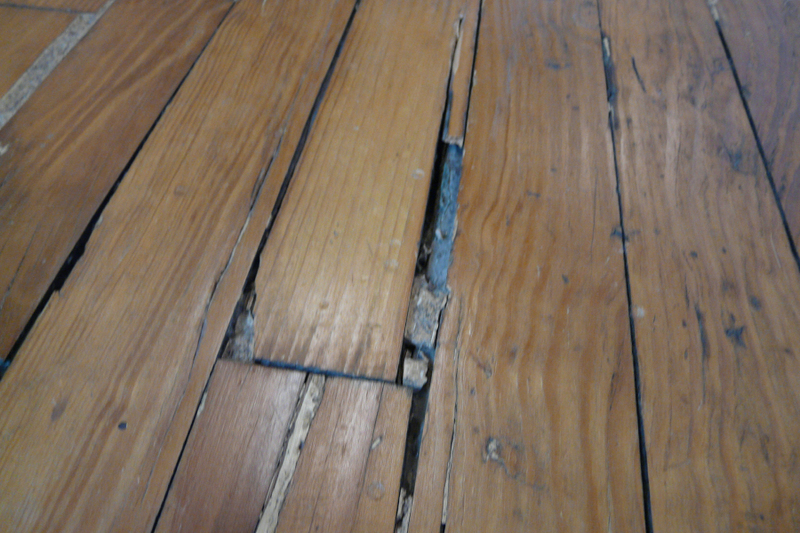 And that works just fine until the floors need to be refinished. When metal objects are above the surface level of the floor, traditional sanding is impossible. This was a conundrum. Fortunately, Passive Refinishing® offers an alternative to aggressive sanding. When I developed the process, my focus was on old, historic properties that had already lost too much wood or had some compelling reason for not losing any original material. In the case of this house, it was the presence of the nails that created the problem and stopped the idea of refinishing dead in the water. There was also some very serious surface abrasion from a pet in the layers of finish that had been dumped on the floor over the decades. Work commenced in October of 2013 and it went smoothly. Once the old coatings were gone and we had finished our prep work, the homeowners chose the stain they wanted and we completed the project on time and within our budget. We made four applications of a high quality waterborne urethane finish and the floors were ready for the homeowner and their furnishings. Below is a short gallery of photos that showcase this handsome floor and its unique installation.